Happy September OCS fans! Fall is in the air - it is my favourite season. I love the crisp feel in the air and my cozy sweaters. 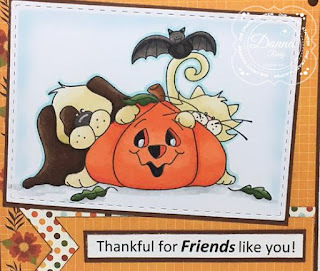 Thanksgiving is just around the corner to and I am always thankful for the friends I have in my life. 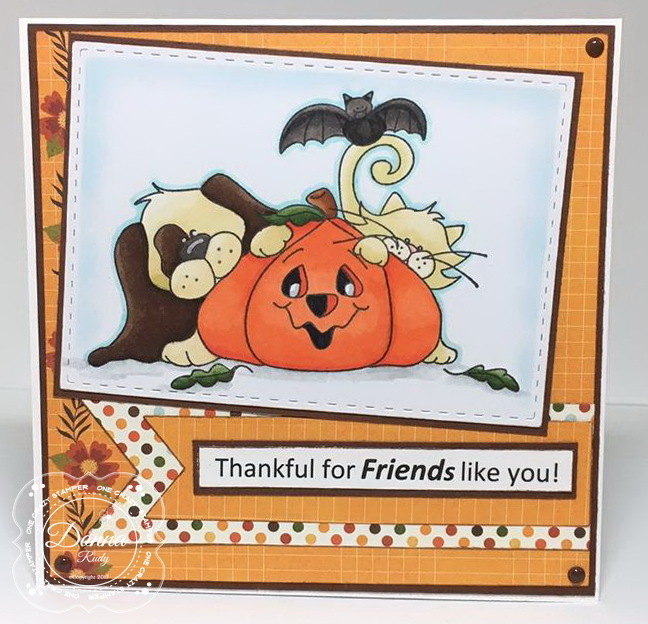 Our friends come in all shapes and sizes so I chose to use this more of a Halloween theme stamp to make a card celebrating my friends. These fun friends are coloured with alcohol markers and cut out using a stitched rectangle die. I added some freckles to the dog and cat using a brown marker. The sentiment was created on my computer and cut out using fishtail banner dies and mounted on patterned paper from the Story of Fall collection from Echo Park. I left the die on the image and used baby blue ink around the edges. Some gumdrops finish off my card. Once again another great card and design! Love your colouring and that layout! Anyone is lucky to have you as a friend! You are so caring and thoughtful! !